**Cost-share for SVWC’s large acreage weed control program is prioritized by earliest request date. For landowners/managers that have requested cost-share in the past, the SVWC Board of Directors will place a higher priority for cost-share on those that have developed a Weed Management Plan (WMP). A template WMP from the Stillwater Weed District can be found above. NOTE: Due to fees associated with PayPal, there is an additional $2.00 charge for the convenience of paying via credit card. Thank you for understanding. Please specify property address if different than mailing address. Thank you! Yes, I want to participate in the 2018 Cooperative Weed Control Program. Payment of $120 ($35 annual membership and $85 prepayment) is on its way. Yes, I want to participate in the 2018 Cooperative Weed Control Program. I have already paid my 2018 membership. Prepayment of $85 is in the mail. Yes, I want to participate in the 2018 Cooperative Weed Control Program. Please accept payment via my credit card. 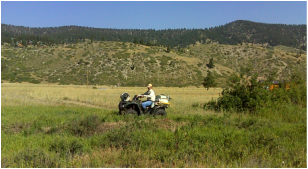 Please take a look at my property prior to treatment to determine the level and type of noxious weeds present (if any).